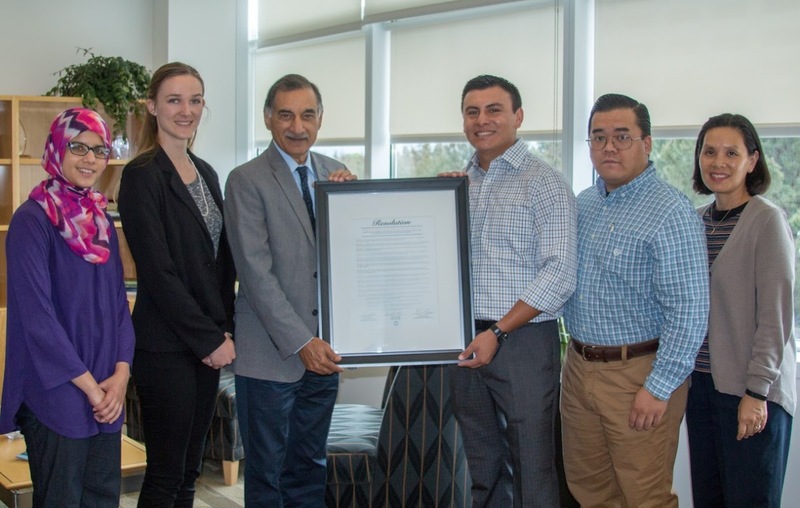 BICC officers, Mihaylo’s representatives on the ASI Board of Directors and Assistant Dean for Student Affairs Emeline Yong honor Mihaylo Dean Anil Puri (third from left) with the honorary resolution from the ASI Board of Directors on May 5. Cal State Fullerton’s student government has honored Mihaylo Dean Anil Puri with a resolution recognizing him for his dedication to Mihaylo students and the mission of higher education. Mihaylo Dean Anil Puri joined the college faculty in 1977 as an economics professor. After serving for years as the chair of the Department of Economics, Puri was appointed dean in 1998. Under his 18-year tenure, the college has grown to become the largest accredited business college on the West Coast and moved into a newly-built state-of-the-art facility. The alumni and business network has grown to more than 50,000 people and the college has developed strong bonds with the local community through its 15 centers of excellence. Student development, career training and innovative teaching have flourished. “I took on this initiative to honor Dean Puri because I believe it is within the realm of the ASI board’s responsibilities to acknowledge the outstanding accomplishments, innovative efforts and dedication from an individual who has done exceptional work for the advancement of the student body’s campus life and experiences in both academic and professional settings,” says Joseph Nguyen ’16 (finance and economics), one of Mihaylo’s two representatives on the ASI Board of Directors. The full text of the resolution is available online.